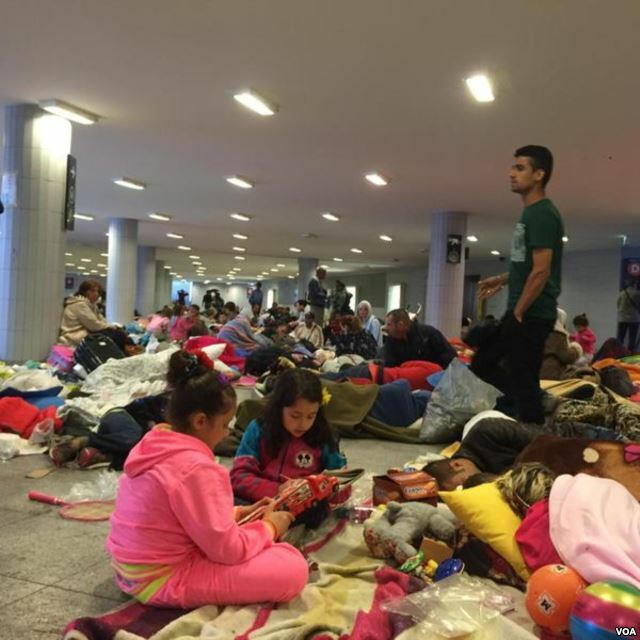 Refugees wait for a medical check after arriving at the main train station in Munich, southern Germany, Sept. 5, 2015. Trains filled with refugees are finally arriving in Germany Saturday after days of delay at Hungary's Keleti train station in Budapest. 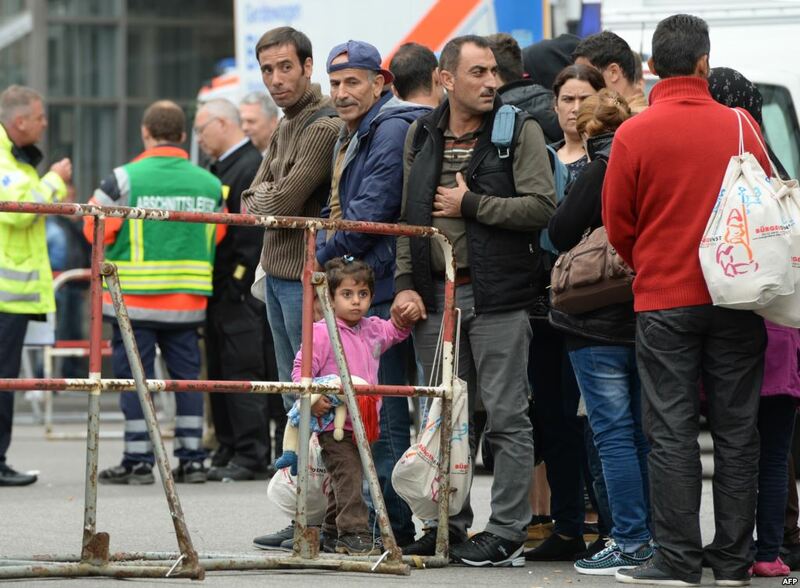 Reports from Germany and Austria say the first trains carrying refugees left Austria for Germany on Saturday, just hours after they were bused from Budapest to the Austrian border. Thousands of migrants are now entering Austria. It is a breakthrough after a week of uncertainty about the status of refugees seeking asylum inside the borders of the European Union. Austrian officials said Saturday that several thousand refugees have already passed into Austria where they have been greeted with aid packages and a place to sleep. 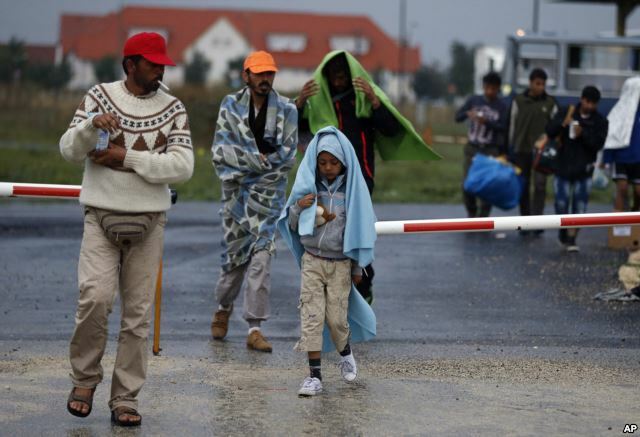 Austria’s chancellor said his country and Germany will grant the migrants unhindered entry. Chancellor Werner Faymann announced the decision early Saturday after talking with German Chancellor Angela Merkel. Migrants arrive at the Hungarian-Austrian border in Nickelsdorf, Austria, Sept. 5, 2015. Many refugees left Hungary's Keleti Train Station in Budapest on foot Friday after days of waiting for Hungarian officials to allow them to travel. Hungary later sent buses to pick up the hundreds of migrants spreading out along a six-lane highway as they headed west toward the Austrian border. Migrants flash victory sign and thumb-up after arriving at the border station between Hegyeshalom, Hungary, and Nickelsdorf, Austria, Saturday morning, Sept. 5, 2015. Even as crews cleared piles of garbage and removed portable toilets at Keleti train station in Budapest, authorities are bracing for a new wave of refugees heading toward the city from Hungary’s border with Serbia. Police officials in Budapest on Saturday said Hungary would not provide any more buses to take the refugees to the Austrian border. 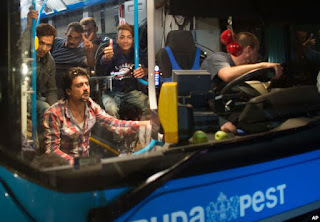 A few hundred were not able to get seats aboard the buses and remained stranded at Keleti station Saturday. Tariq, a 25-year-old university student from a suburb of Damascus, said the ordeal is showing no signs of ending. He managed to make it to Austria several days ago, but the car he was in crashed when the driver fell asleep. Austrian police sent him to a hospital for treatment and then returned him to Hungary. With his face and one arm in bandages, he said he was resting and missed the last bus. Too tired to walk, Tariq is unable to join the hundreds who set out for the 174-kilometer journey to the crossing at Hegyeshalom Saturday. With $278 left in his pocket, he is unable to pay the fares that taxi drivers are charging refugees to drive them to the border. Hungarian leaders have been reluctant to help the refugees, cutting off train services between Budapest and Austria earlier in the week in an attempt to stop the flow. Police fired tear gas in an effort to disperse the refugees. But aid organizations and ordinary Hungarian citizens began showing up with bags of food. Volunteers turned out to help feed and comfort the refugees. For some Hungarians, the memory of times when they have been refugees has influenced their decision to help. The Hungarian government installed portable toilets and water faucets and there was even a large screen put up to entertain the refugees’ children with American cartoons. But the accommodations were short-term. 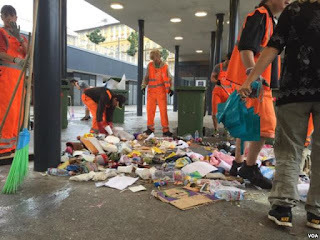 Crews removed the toilets, washing facilities, and the big screen on Saturday morning after providing buses to the refugees. The message to migrants: move on. Many Hungarians agree their country should provide humanitarian assistance to the refugees, but some say allowing them to stay here is not an option. “Refugees and migrants are two different things. The refugees are welcomed here, but the migrants are not,” said one Hungarian traveler, rushing to catch a train on Saturday. Tariq says he does not want to stay in Hungary and his goal is to reach Germany, where he has a Syrian friend. It is that hope that keeps him going on a journey that has been all but easy.